And I thought this style had disappeared. Well, This is all kinds of awesome. Pretty cool retro artstyle you've got going on in your gallery too. I'll have to look at it a bit more often. also, DA says it's your birthday today. So Happy Birthday to you. have a good one. Fantastic work as ever Phil! Once again your work is really grand in capturing the old anime style! You put Masami Obari and those like him to shame. Simply amazing especially the amount of details you put in otherwise hope he will like it. My two favorite rivals. Forever locked in conflict. Fuuuuuuuug that is some good stuff. 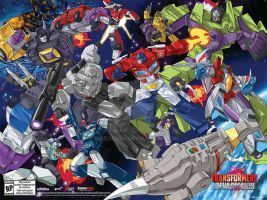 awesome drawing, megatron looks sick! There will always be one who stands and one who falls. One shall stand, one shall fall! The only and true incarnations of these two eternal enemies. Well, expect for all the others. Epic show of that near timeless rivalry.